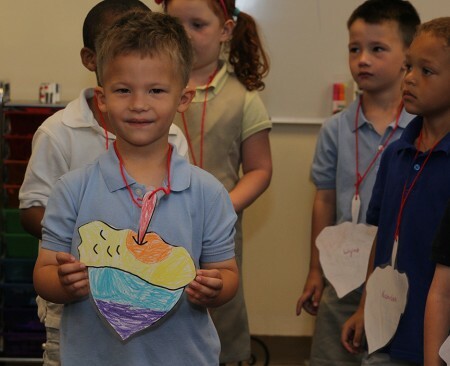 When I took the boys to Kindergarten Screening at the beginning of the summer, they took the first time parents on a tour, they handed out new information, and they talked about Kindergarten Camp. I thought that Kindergarten camp must be new, but they told us that they have offered the program for years and it used to only be for the students who truly needed the extra help before starting Kindergarten. My initial reaction was to let them enjoy the summer in their childcare program and spend the final few weeks with their preschool friends. 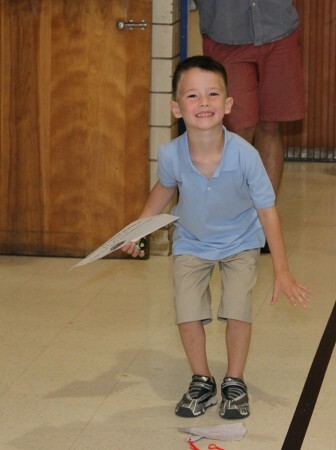 Then we decided that it was worthwhile for them to have a head start, learn the Kindergarten routine, meet some of their future classmates, and learn their way around the school so they would be more comfortable on the first day. Camp was Monday-Friday, 9:00-2:30, for 4 weeks in July. 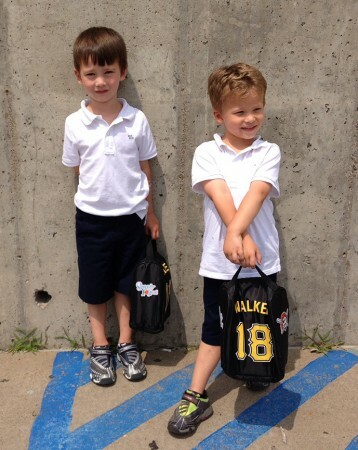 Ruslan probably would have been happier in childcare for the summer, but Wyatt was so excited for camp to start. There was a day or two that he asked to stay home, but for the most part he was happy to go each day and the drop-offs were certainly easier than childcare had been in recent weeks. 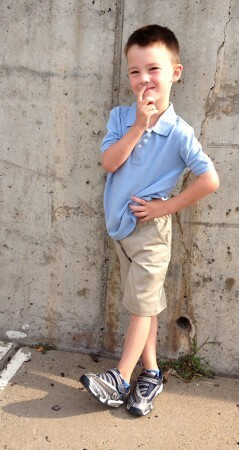 Both boys thrive on routine but it is especially important for Wyatt. 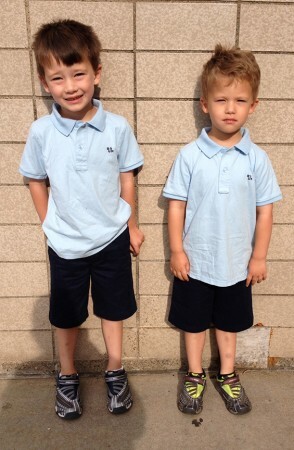 I wasn’t thrilled that they had to wear uniforms to camp, but it is part of Kindergarten. As we were walking toward the school entrance on the first day, I realized that I didn’t take any pictures at home – so this is the first day of camp picture. I promise to do better on the first real day of Kindergarten. They were busy in the hallway as we waited for the other Kindergartners to arrive, running and pushing each other until the principal told them to stop. At the end of the first day I watched them walk quietly down the stairs in a straight line – hip and lip (we learned about hip and lip from Juliana). Since camp ended at 2:30, I picked them up and drove them to their childcare program for the remainder of the day. 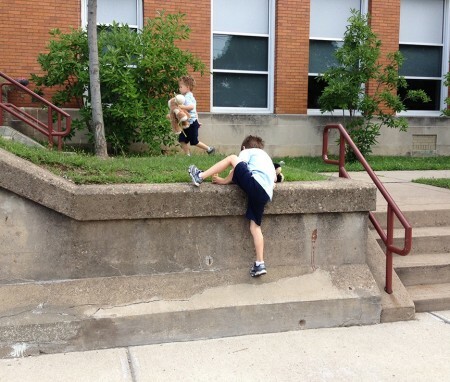 A week later I found out that my wild boys had taught their preschool friends about hip and lip and told the teachers that every one should be quiet in the hallway. The four weeks of camp went by so quickly. Between drop-off and pick-up and getting Juliana to and from her camps, there was a lot of running around but we made it. 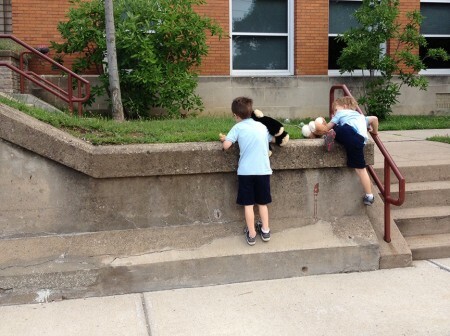 Each morning the boys took the long way to the front door, getting one last bit of climbing out of the way before school. On the last day, the children performed songs and we had a pizza party to celebrate the end of camp. They are still talking about their new friends and teachers and I think that they are ready to start Kindergarten next week. I know that they are very excited to finally get to ride the bus!